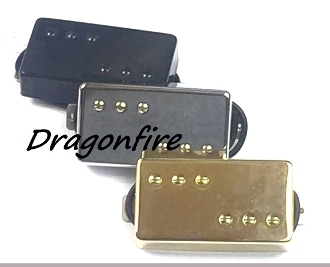 Dragonfire 3x3 HWRs are wide range humbucker pickups offering the high output, sweet warmth and smooth clarity you crave in a standard covered humbucker size. These 2-wire split humbuckers can provide you with vintage authenticity and classic styling while still granting you hot output performance. These are wax potted pickups and boast an Alnico 5 bar magnet style for well-rounded and highly charismatic humbucker performance. With a covered pickup cover style, these wide range humbuckers give you a clean, striking look while amplifying your playing style. The alnico magnets in these pickups provide warm, creamy tone for a less harsh and more true vintage sound. The bar magnet offered in these split humbuckers can help you avoid string-to-string definition loss and provide strong string response in a variety of playing styles. These 3 x 3 humbuckers give you an even dynamic for sweep picking; this magnet style is preferred by players who want to help make sure bends and vibratos will not choke out. These pickups are standard covered humbucker size. They are not the same size as uncovered or specialty-sized pickups. It is important to check your measurements prior to purchase.